This is how Agricola works as a physical board game. It's a mad whirlwind of cards and resource counters and fence pieces and play fields. There is math involved, turns to keep track of, resources to manage — it's brilliant. It eats an entire table, but there's nothing wrong with that. Unless there is. I don't have table space. I don't have regular gatherings of people willing to spend the time setting up a magnificent game like Agricola, let alone playing it with me. I own a copy of the physical game, which I've fondly looked over on various occasions, but I've never had the opportunity to play. And now I have, thanks to Playdek's faithful adapatation. It's still a game about raising a family and building a farm. There are still crops to gather, renovations to perform, livestock to raise, wood to chop, stone to pick — all of the game's glorious minutiae is intact, but I can play it online, likely against other people I'm sure have the boxed game sitting in their closet. Here's how the game works. You play a couple raising a family on a farm. Each turn you get an action for each person in your family, during which you can gather materials, plant crops, build useful additions to your home, et cetera. You can add more workers, expanding your family, but during upkeep you have to make sure you have enough food for each member. Players have to balance food, farm, fauna and family to come out the other end the winner. 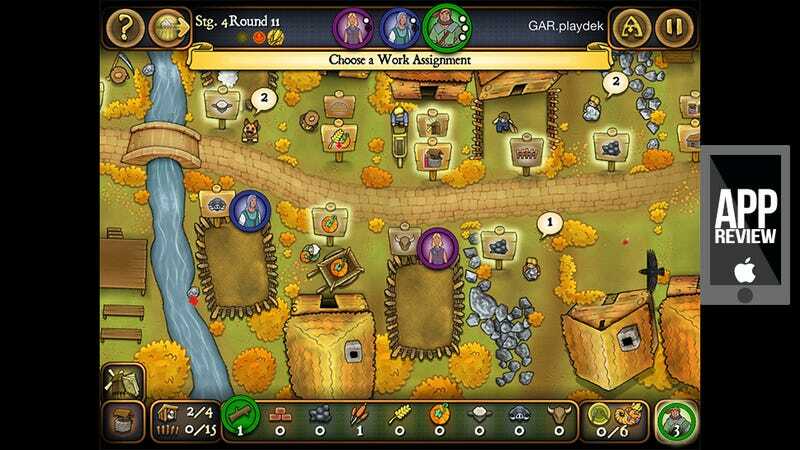 Playdek's version of the game simplifies farming, livestock-raising and home-improving with a single screen that acts as the players' building area. The screen at the top of the post is the action screen. Workers can be dropped onto these spaces to select which actions to perform in a turn. The winner of an online match of Agricola is determined by math, which the app (thankfully) takes care of. Each player acquires or loses points based on their performance across a number of categories, with the highest score winning. It takes a sharp mind to balance actions and improvements with food generation and family growth, which comes much more freely when you're not worried about spilling coffee all over your expensive board game. It's not merely the convenience that makes Agricola such a wonderful digital adaptation. It's the game's accessibility, especially where new players are concerned. Imagine a board game novice wandering about a science fiction convention's gaming area. They see people playing a game like Agricola — it looks really interesting, but they're worried the learning curve might be too steep. Here's a place to learn. I wish every modern board/card game had one.